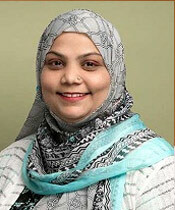 Qurrat Ul Ain Umair has extensive experience in Physiotherapy and rehabilitation. He completed his Bachelor’s Degree from College of Physiotherapy, Ziauddin Medical University, Pakistan in 2008. He worked in several reputed clinics/hospitals. He is certified by the Egyptian Board in orthopaedics and trauma since 2011 and the Arab Board in Orthopaedics and trauma since 2013. Dr. Mohamed can speak English and Arabic.